This man has every reason to smile after the weekend he just had. Wrapping up a few items relating to the Cleveland Browns while also wondering how Mike Pettine became the second-longest tenured head coach in town before he even coaches his first game. We went over what we liked about the Browns two first-round picks on Friday, and now that the entire draft is in the books its hard not to like what the Browns did over the weekend. 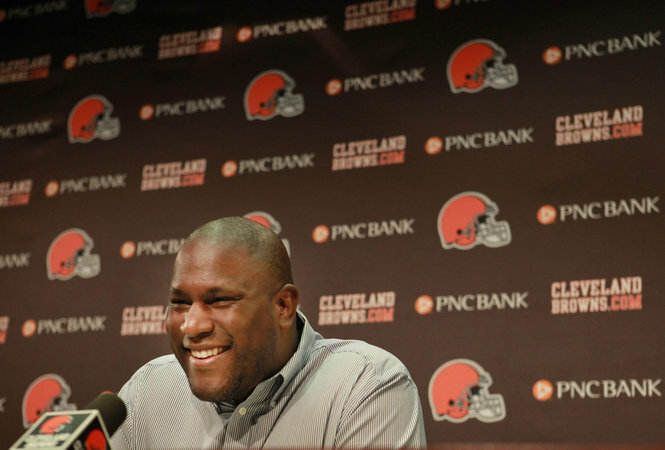 (Of course, we thought we liked the 2012 draft as well, so …) In looking at the players the Browns picked, its clear to see what general manager Ray Farmer and Pettine have in mind for how they want the Browns to look. The Browns upgraded the defense with cornerbacks Justin Gilbert and Pierre Desir – who are both bigger than Buster Skrine and Leon McFadden, the players they will be taking playing time from – and appear to be ideal fits for Pettine’s defense. And in linebacker Christian Kirksey, the Browns picked up a player who can’t be any worse in pass coverage than incumbent starter Craig Robertson. While we would have liked to have seen the Browns select Kent State’s Dri Archer – who went to the Steelers three picks after the Browns selected West – we get it. West is a tougher runner than Archer, and if the Browns continue to draft players in that mold, it seems safe to say we are seeing the beginning of the transition to a Browns team that is no longer going to back down to the likes of Pittsburgh and Baltimore. Speaking of the Steelers and Ravens, it was interesting that all four teams in the AFC North went with a defensive player with their first-round picks. While we are more concerned about C.J. Mosley going to Baltimore and Darqueze Dennard landing in Cincinnati that we are about Ryan Shazier going to the Steelers, things definitely did not get easier for opposing offenses in the division this weekend. And it was good to see the Browns getting on board with that line of thinking. As for the other big news of the weekend, while we are probably being delusional we are still holding out hope that Josh Gordon’s reported suspension turns out to be false. That remains a remote possibility, of course, but we did clasp onto a glimmer of hope after reading Peter King’s Monday Morning Quarterback today. King addresses the situation, writing the Gordon could be banned for “somewhere between eight and 16 games.” Since the Browns knew about the suspension before the draft and chose not to select a wide receiver, it is possible they have a strong idea that Gordon’s suspension will not cost him the entire season. If that is the case, that would go a long way toward explaining why Farmer decided to stick to his draft board, primarily in selecting Bitonio to help the offensive line other a receiver in the second round, rather than look for a replacement for Gordon. One last thought, for now, on the possible Gordon suspension. Over the weekend Farmer found himself in a bit of a tough situation as he could not answer questions about the news because the NFL’s substance-abuse policy has a confidentiality clause barring teams from making a comment until the entire process plays out. But somebody obviously said something, because the Outside the Lines report cited two unnamed sources as claiming that Gordon tested positive for marijuana. Gordon reportedly received a letter in “early winter” saying he had failed a drug test, and then a second letter just a few weeks ago saying he faced a suspension and had a right to appeal. Farmer, along with owner Jimmy Haslam, knew about the possible suspension, so the league is allowed to tell employees of the team at a certain level what is going on. But there is no reason for Haslam and Farmer to reveal the news, because what good would it do the Browns? We’ll let you connect the dots from here. Finally, the Browns ended the short tenure of quarterback Alex Tanney and the even-shorter tenure of quarterback Vince Young on Monday, releasing them along with Brandon Hughes, Brian Sanford and, proving that they are getting serious about the running game, Fozzy Whittaker and his 2.8 yards per carry average. The team also announced the signing of 11 undrafted free agents, if that kind of thing gets you excited. While it is more important to win in the fall than it is to win on draft weekend, it never hurts to look at a Browns draft and have it all make sense, which was the case this year. Even if we’re not quite ready to have a rational discussion about Manziel being the starting quarterback for 16 weeks.